Yesterday I took a sample from four recently kegged brews. They were sitting at room temperature for about a week or so. I was interested in their level of carbonation and overall clarity and taste. Also, my brother was visiting over the weekend, and I wanted to give him a sample of all my lagers fermented over the winter. After pouring and tasting the lot, I notice a really attractive color gradation. Conveniently, my wife was sitting at the dining table with her camera close by. This photo shows off the colors and clarity pretty good. They were poured in very old 10oz. glasses given to me by my Grandmother. I like the ghostly reflections on the table, and the solid clear glass feet of each glass. Just thought I'd post something simple and fun for the time being. I've got lots of things going on right now, so posting has been slow. I've been building games from reclaimed/found materials. But more brews are near in the forecast, like big batch of Ordinary Bitter,an ESB and a Sterling pale ale. Very cool picture. Do you filter your beers, or are they that clear just from secondary fermentation and being kegged? Great picture! I noticed the clarity too. I used gelatin to clarify a recent batch of pale ale, but I think it would've been more clear if I put it through a secondary process. I just wanted to drink it and I couldn't wait any longer. I am impatient... I bet each one of those beautiful beers are delicious! 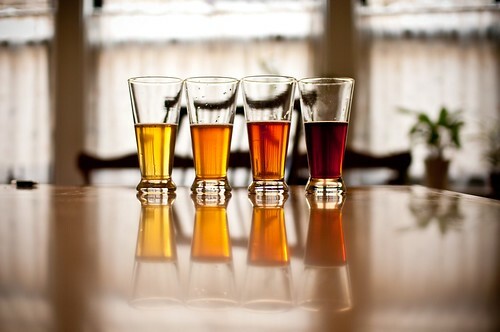 Nice pictures, I dig the colour of the Golden Rauchbier. I agree with the above posts, the clarity is great! Cheers guys. Thanks to my wife for taking this photo. These brews were sitting at room temperature. So they don't have any chill haze. By the way, I think all super fresh beer should enjoyed at room temp or slightly chilled. After chilling to drinking temps they will definitely be a tad hazy. But I really like how lagers do continue to "lager" in the keg for a few months, ans as they are drunk, they get better and better. They also get clearer and clearer. They are all quite good. In fact, I had a bit of a scare when fermenting the Awktoberfest. It climbed all the way to 79 degrees, but it tastes fine. I'll do a write up in the coming weeks. Ah those herbal beers. I really need to write about them. I'll put it on my to-do list. those are some good looking beers. do you force carbonate or use priming sugar when kegging? I use priming sugar (corn sugar). Then I will force carbonate if the level isn't where it should be. If the level is short, usually a good 20-40lb for half-to-one day is sufficient. I love our dining room table. Makes everything look so pretty! Yay! Pretty beer! Glad to here the Awktoberfest turned out tasty. I told you it would! Great pic. Hope to see more from you soon!